ORION Investment Real Estate is pleased to announce the sale of the 10,015-square-foot Golden Corral in Yuma, Arizona. 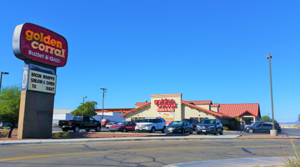 Selling for $4,131,633, and nearly $413 per square-foot, the stable and successful Golden Corral Restaurant has been operating since mid-2004. The property is situated at the intersection of two major highways, Interstate 8 and Arizona 95. Across Interstate 8, Yuma Palms Regional Center is an outdoor regional mall that includes Target, Dillard’s, JC Penney and Sam’s Club. Radisson, Fairfield, Baymont by Wyndham, Homewood Suites, and Hampton Inn & Suites are just some of the examples of hotels in the immediate trade area.